October 14, 2016 – Managers for NASA’s Juno mission to Jupiter have decided to postpone the upcoming burn of its main rocket motor originally scheduled for October 19. This burn, called the period reduction maneuver (PRM), was to reduce Juno’s orbital period around Jupiter from 53.4 to 14 days. The decision was made in order to further study the performance of a set of valves that are part of the spacecraft’s fuel pressurization system. 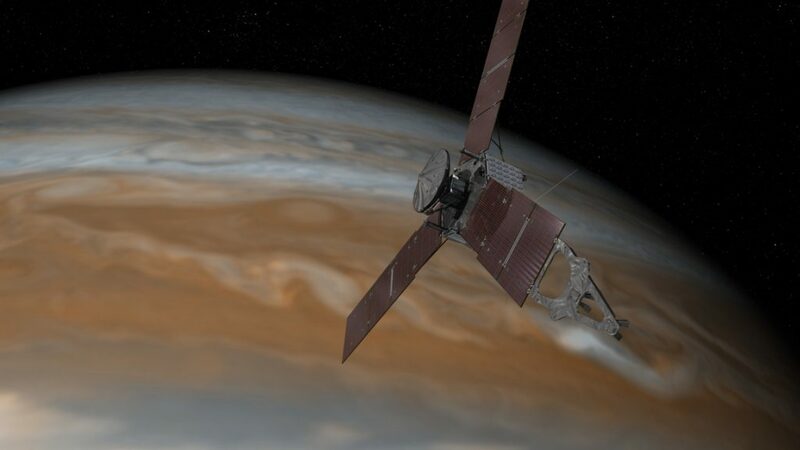 The period reduction maneuver was the final scheduled burn of Juno’s main engine. After consulting with Lockheed Martin Space Systems of Denver and NASA Headquarters, Washington, the project decided to delay the PRM maneuver at least one orbit. The most efficient time to perform such a burn is when the spacecraft is at the part of its orbit which is closest to the planet. The next opportunity for the burn would be during its close flyby of Jupiter on December 11. Mission designers had originally planned to limit the number of science instruments on during Juno’s October 19 close flyby of Jupiter. Now, with the period reduction maneuver postponed, all of the spacecraft’s science instruments will be gathering data during the upcoming flyby.